"Chrysalide" is a suspended light made entirely by hand, using exotic timbers and re-orient table hammered brass shades. With its large diameter and wide circle of light it has been designed specifically for large spaces, such as halls, lounges or foyers. "Chrysalide" is both an opening flower and an emerging insect. This one is made with hammered brass and exotic wood. This model can be made by order with the convenient measurements for your space, and materials. The lamp is delivered in a specially designed cylindrical wooden box with wheels. The lamp is folded inside. Position the box below the suspension point and with the help of a pulley and a rope (both included) remove it from the box and raise it to a height of approx. 1m from the ground. Unfold the arms and shades (simply by lowering them). - Each arm has two joints, one joining the lamp structure and the other the individual lampshade. Once the arms and shades are in position, raise the entire light to the ceiling and fix in position. Design: Oma Light Spain, Barcelona, 2017. 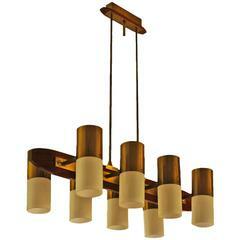 Chandelier with eight lights, solid teak, polished brass and plexiglass lampshades, Italy, circa 1960. Lampshades height: 25 cm. 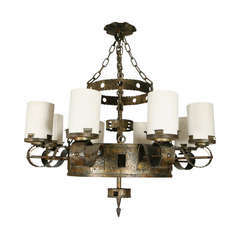 Chandelier, blackened steel structure, six lights with white opaline lampshades, polished brass hardware. Italy, circa 1950. 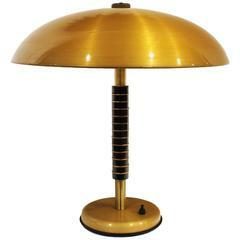 Desk lamp, stand with wood pieces alternated with polished brass rings, brass lampshade. Spain, circa 1960. Pair of pendants, 1 light, blackened steel, polished brass and white opaline. Maker: Stilnovo Italy, circa 1960 Measures: Height 104 / 120 cm. Pendant Lamp in Wood and Brass. Brazilian Contemporary Design by O Formigueiro. This pendant lamp is made in Brazilian Canela Preta reclaimed dark wood and brass. Different types of wood available upon request. Ready for E27 lamps. Eight-light wood and iron chandelier with shield, cross and knight, circa 1930s.